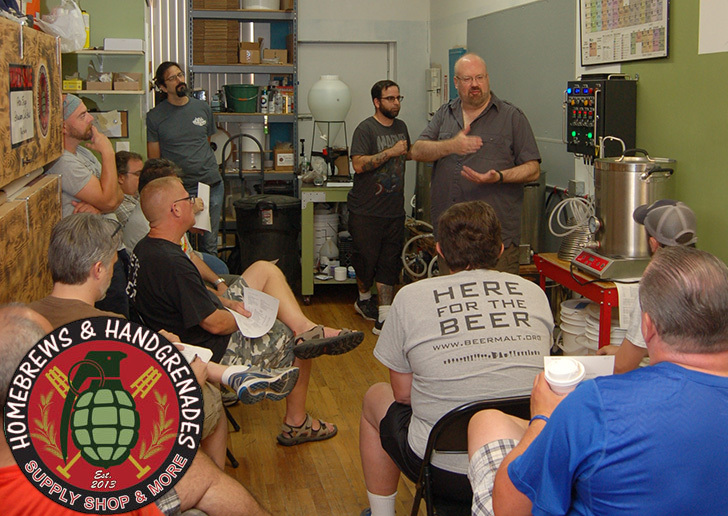 Gordon Strong recently visited New York state for a 48 hour period to coincide with his latest book Modern Homebrew Recipes. 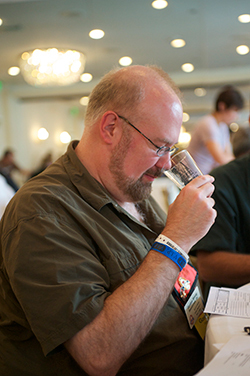 Gordon is the president and highest ranking judge in the Beer Judge Certification Program (BJCP) and also authored the book called 'Brewing Better Beer - master lessons for advanced homebrewers'. (Both books are well worth the read). Simply put, I don't think there's anyone in the world that knows more about brewing beer than Gordon. I try to read everything he puts out. I thought the coincidence here was kind of neat: During his stay he visited a couple of homebrew shops that both happen to run our Electric Brewery setup and brewed on one of them! How cool is that! Peter Tripp (owner/operator of Homebrews & Handgrenades) can be seen to the left of Gordon staring intently at his control panel. Last thing you want to do is screw something up with Gordon Strong in the house! The 3 kettles are behind Gordon - the single kettle on the induction burner to the right is likely for simplified extract only brews. At Homebrews & Handgrenades Gordon brewed a recipe modeled loosely on O'Hara's Leann Follain, a 6% ABV Irish Extra Stout. There was a write-up and recipe in the Jan/Feb 2017 issue of Zymurgy magazine where he also describes how the resulting beer tasted. (This is where I first saw the picture of Gordon standing in front of our control panel and thought "Hey! Those are two things I recognize!" ). I'm curious how he liked brewing on our setup. I'd love to know but am too shy to ask! In talking to Peter (owner of Homebrews & Handgrenades), he mentioned being pretty excited about having Gordon in his shop. I can only imagine. I think I'd be pretty nervous!